Croom House lands were once part of the Croker Estate which was transferred in a 999 year lease by John and Edward Croker to Denis Lyons in 1781. During the next decades the Lyons family built the main house, the mills on the river where the mill wheel still turns, the courtyard with staff quarters, substantial stabling and individual staff houses. They also funded and built the Catholic Church and School at that same time. Descendants of the Lyons Family ran their businesses in Croom until November 1947. In August 1934 Henry Anthony Montagu Lyons a young and only son of James Lyons inherited Croom House and its demesne lands. He was killed in the Second World War on the 24th February 1944 and his widow sold the remaining lands and house in 1947 and moved to the UK never to return. Today Croom House is the property of Denis and Joan Brosnan who purchased the house and lands in 1986, restored the stables and yards and brought their own thoroughbred horses onto the property. 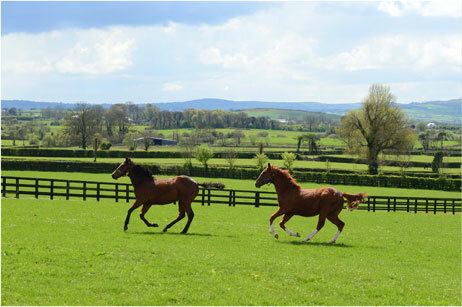 Subsequent lands and houses that had been sold off have been acquired and restored and today Croom House Stud farms 270 acres in the Golden Vale of Limerick. 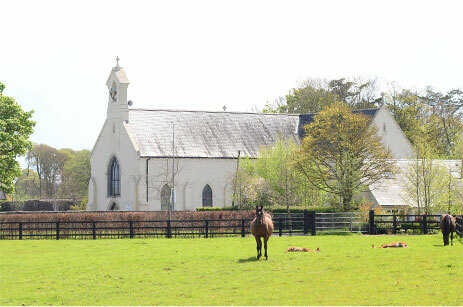 Thirty broodmares are kept, owned by Denis and Joan Brosnan or by the family company Epona Bloodstock Ltd. The rich limestone land makes it possible to keep mares, yearlings and other followers outside in sheltered paddocks for most of the year with minimal time spent in stables. This has enabled Croom House to produce strong tough horses with great bone who have made their mark on racetracks throughout the world over the past twenty years. Cattle and sheep are also kept to graze the paddocks and with the farm closed to outside equines the risk of disease is minimal. The staff has grown with the farm over the years. The team is now led by Cathal Brosnan who is supported by Joe Hartigan, Manager of Croom House Stud and Peter O’Riordan, Manager of the Manister, Yearling Farm. Our team has years of experience looking after all the needs of thoroughbred horses.